The founders of Home Edit, Clea Shearer and Joanna Teplin, started the Home Edit in Nashville to reinvent traditional organizing and create functional systems that were stylish and design oriented. Instagram sensations, the duo has organized across the country and for celebrities including Reese Witherspoon and Gwenyth Paltrow and other celebrities. 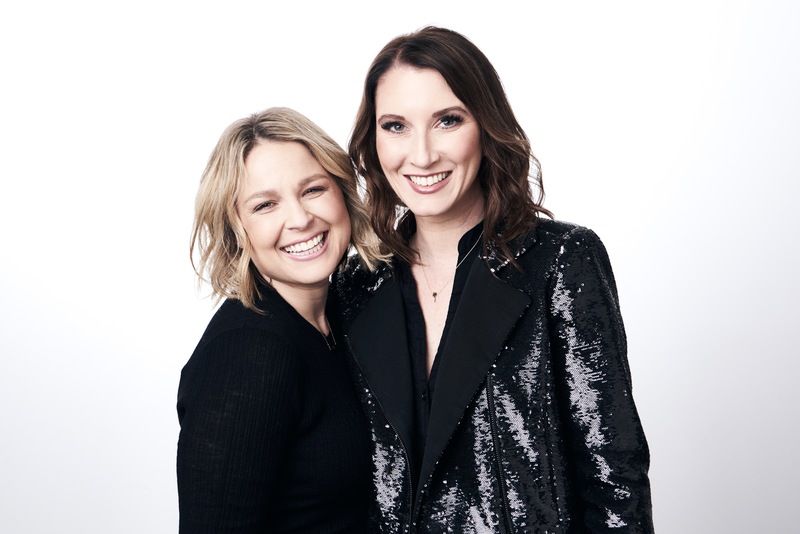 Their book "The Home Edit: A Guide to Organizing and Realizing Your House Goals" comes out this month..
Clea Shearer and Joanna Teplin, the co-founders of The Home Edit, are both California transplants, who now work from Nashville. Their business began as a friendship but soon they were running an organizing business that sought to bring style and substance to this field. The Home Edit goal is to create functional systems that can be part of a long term solution for storage and easy living. But jazzing up the look of everything and incorporating stylish details is an important part of the package. They have a very popular Instagram account with more than a million followers (@thehomeedit) that shows their work and ideas. Clea and Joanna have a new book that is just coming out: "The Home Edit: A Guide to Organizing and Realizing Your House Goals." Let's chat. Hey Clea & Joanna here! We are so excited to answer any and all questions! How do you keep big floppy purses from falling over? Depending on the material of the hat we love to use a basket (like a montauk in a closet)...we have also used arylic risers to set hats up on a shelf and have them displayed! We do not have a play room, so most of our toddler's toys are kept on the first floor, and are visible as soon as you walk into our row house. The first floor is open so there aren't many places to hide them. We use a storage ottoman for most of his toys, but then still have a little kitchen and some trucks to organize. Any thoughts welcome. The area under the kitchen sink is yucky looking no matter what I do. Any ideas for how to arrange all those products? Have a design challenge? If you live in the D.C. area and are looking to refresh a room in your home, send an email to makeover@washpost.com describing your problem. We may use your space in House Calls, for a virtual room makeover, including free advice from a professional designer. How do you encourage your kids, partners, and helpers to keep up the systems and organization? Such a great question! We truly believe that if there is a system in place with LABELS then it is easier for other family members to know exactly where to put items back. We do sell custom labels on our website! Also keep the system simple and not overly complicated with more general categories vs. specific. If you could organize ONE person’s closet/pantry in the world (your Dream Home Edit), who’s would it be? We both agree - Queen of England or obviously Oprah! How many books should you keep? And if they are in boxes in the attic should you get rid of them? Open the boxes...really see whats in there and do an "Edit" to keep what you love, display them, use them, and get rid of the rest. Suggestions for organizing board games and children’s game closet? The boxes they come in are always breaking or so flimsy and varying sizes. This is one of our most favorite things to do! We LOVE to unbox a game. Use Womens and Mens shoe boxes from The Container store, with smart store cups inside to contain any small pieces. For the larger boards that wont fit into a shoe box...use an acrylic magazine sorta to stand the boards up on a shelf! Divided turntables are also so great for holding small game pieces in one area. Hi there. My seven-year-old son is getting his own room for the first time. He'd like red (!) walls. Any ideas for how to steer him to something we both could live with? A suggestion of red paint color would be great too. Thanks! Encourage him to get a red bed spread or red art work that can be easily changed in the future! Will you ever expand and come to Chicago? Organization seems easier to teach than style. Do you have any tips on how to cultivate style/ an eye for design? Find consistent containers that match the feel of your home. Winter won't go away and while you're spending time inside looking around your homes, get inspiration for some things you might want to freshen up. Read my article about designer Lauren Liess and the 5 household items she's going to replace now. I love how beautiful you make pantries look. My problem is that I have a completely open kitchen, and a small pantry to store all food, dry goods, sauces, coffee etc. It is impractical to keep beautiful quantities of the same item due to the lack of space. Do you have suggestions for making different size and color foods look good together? I am having a baby in a month so any tips that are sustainable/easy are greatly appreciated. Hello - I am a single mom of two girls, living in a New York City apartment. My daughter’s are four years and 3 months ... how do I preserve “hand me down toys” for my younger daughter - but still keep my older daughter’s toys current and clutter free? Clear storage boxes from The Container Store. The "OUR shoe boxes" are a great and cost effective storage solution. Especially the boot boxes which can be easily stacked and placed under beds! How do your husbands and children deal with your quirks and OCD organisation? Do you recommend dressers to store clothing and what would you look for in a dresser? If you need the additional storage than a dresser is always a great option. We love any drawer that is more than 12 inches deep because it gives you more choices of product to use inside a drawer. I’m looking for a cleaver and convenient way to organize my jewelry. Any suggestions? Use vintage tea cups to place necklaces or rings and they can be beautiful counter display! Who has been your favorite celebrity to collaborate with? Way too many! We honestly love them all. What’s the best way to organize a new house when you have a lot of stuff?! "Edit" first. Make sure that everything you are bringing into a new house is what you want! i just moved into a new apartment but it has no linen closet. right now i've crammed my linens into an armoire from ikea but is it worth installing shelving in a closet for them? or somehow finding how to build a linen closet? If it's possible to just place a free standing shelf unit in the closet that may help instead of installing one. Then you can use baskets and store linens and towels! Beyond avoiding divorce, what benefits do you see growing your team in cities across the US? And what have been your concerns in expanding considering this company is so beyond what you imagined when starting THE? Also, can’t wait for THE Bay Area!!!! We truly just love the idea of being able to be available and help in as many cities as we can! What are your thoughts on the Kondo method and the effect it's had nationally? We absolutely love her file folding method! What do you think the turning point was in building your company that has since brought you the amazing success you have now? Do you think it was a certain client, word of mouth or possibly just your hilarious social media personalities? I live for your IG stories! ! We are so fortunate for a combination of all of those things! How much backstock is too much? What is something you wish people would take more time to do when organizing? What is the best starting place when setting out to get your house in check? Start small with a drawer. Always "Edit" the items in that space. We think backstock is great if it's items that you use! What do you think of the 40 bags in 40 days Lenten challenge? We don't know what that is! Should I install rolling shelves or keep the original flat shelf for kitchen cabinets? For reference, my space is limited so I need to maximize as much as possible. Anytime you can have a drawer pull out so you can see all your items....Go for it! Besides going minimalist and getting rid of everything, what are your top tips for organizing tiny spaces? Edit, contain the items, label. i bought one of those open shelf/cube units for my closet to store shirts and workout gear. my problem is that it always looks sloppy. and i can't apply the Kondo method because the shelves are open space, and i can't stack shirts in folded in thirds on top of each other. i have some cloth bins that i have in two of the openings for scarves and tights-is that the solution for it all? The Container Store has baskets that fit nicely into that cube cubbies. Then fold clothing into those baskets. Q: Grown-Ups in a Small-ish Space... With Lego? My husband and I are in a two bedroom condo and we've fallen in love with Lego building sets. As in, we have a neighborhood block of Lego buildings on our dining room table, he has multiple spaceships at work, and I have some major architectural models in my office. How do we display these? I've got artwork on most of my walls at home, so there's not a lot of space for items with a 12" x 12" footprint! I’m interested in tips on keeping track of items in a home. I have a small, but not cramped house, with a nice attic storage space, which I just cleaned out. How should I best inventory and store things so I can rotate them in and out of use, either as decor or for their function (like glassware)? I’m lucky enough to have some interesting and beautiful things from a world-traveler great-uncle and other family members long past. It can’t all be used or on display at once, but I have the room to store it in house. Rather than make hard choices, I’d like to swap things out every once awhile to keep things fresh and keep them in use. And in general, I always want to know what’s in my house, so inventory tips would be especially welcome. Use clear bins to store items in and create labels! What are these things? Googled, but no luck. Only one in the master bedrom- how do you shar3 with your husband? My favorite instagrammers and my favorite Post chat all in one! Awwww thank you! We are so happy to be here answering questions from all of you! Do you believe you should only keep things that spark joy? How can we watch your show if we don’t have direct tv? The Direct TV app may still have it available! Is Clea wearing something rainbow related? Is Joanna cozy? Is there champagne and tea nearby? Hope so! hahahaha Joanna is always the most cozy. I am looking for a great suggestion for a dark blue paint for my dining room. The room faces south, with afternoon sun. The kitchen has light grey walls and charcoal tone tiles. How dark should I go? Many thanks for your inspiration. Test a few colors on the walls prior to painting the whole thing! What is the most complicated category of things to organize? BEADS - you have to sort by color and type and size and everything is the size of quinoa. Thank you all so much for asking such great questions! This was fun!